Friday! Before I could get out of the house Friday morning, Ashley hit me again with that same damn question at least five different times, “What are you?” And of course I had to say that I was a big sissy…yada, yada, yada. And of course curtsey each time. What a hassle, but at least my voice sounded normal again. Since I knew Joanna had something special planned for the weekend, I was looking forward to it…and I was dreading it. But to be honest, part of me was far more looking forward to it. Humiliation is funny like that. When you’re as interested as I am in it, humiliation is a two edged sword. You dread it, but you can’t help yourself. You keep going back for more and more and more. I got a text from Joanna fairly early Friday morning telling me she was back. It seemed like she was back earlier than usual. Was that so she would have more time to prepare whatever was in store for me? I don’t know if I hoped so, or prayed not! As usual on Fridays, I had lunch with my work friends. This time, not bothering to even mention Ashley. It was actually a very nice “normal” lunch. How nice. I had a feeling though that nothing about the next few days would be normal for me…probably starting the minute I got home from work. The prospect of the weekend had me nervous and worried. That same prospect had me hungry with anticipation. Joanna was back! I could feel the nervousness in my stomach all the way home. Oddly, the nervousness didn’t increase as I pulled into my garage. “Hi Mike,” Joanna greeted me the moment I walked into the kitchen. Once again, the house smelled good from her cooking. “Hey,” I replied with a smile. “Miiiike!” Ashley’s voice rang from the other room before either of us could say anything else. “What are you?” she asked so quickly I was surprised she managed to say it without stumbling over the words. This time, my response was far from automatic, but of course I said my little sentence about being a big sissy and then I curtseyed. “Where’s your pacifier?” she demanded. “Uh…just going now,” I replied as I headed for my room. She wasn’t even giving me a chance to say hi to Joanna yet. Geez! The damn girl just couldn’t wait to get me back in diapers again – and keep me there. I was getting awfully tired of wearing diapers, not to mention wetting them. I usually handled all my other elimination problems at work, but last weekend Ashley had kind of forced the issue with the smelly stuff. I was hoping I could somehow avoid that this weekend. Yes, being forced to wear and use the diapers was keeping me all too sexually stimulated. I mean, it’s downright demeaning! Especially when they’re literally on display at all times. And Ashley always made doubly sure that they could be seen – all too easily. Not just by her, but by any of her friends as well. Trust me, there’s something about people seeing you wearing diapers that is positively humiliating. And having diapers that show how much you’ve wet them already only makes things twice as bad. And Ashley, for some unknown reason, liked to see these overly thick diapers, soaked! Once I put them on when I came home from work, I knew they would stay on me until I either got spanked, or I got dressed for work the next day, and I had yet to find out what Joanna would what to do about continuing to spank me each evening. The diapers were horrible! Uncomfortable! Impossible to walk in! Impossible to get yourself off in. And I’d never ever admit how much being forced to wear them kept me totally turned on. But I was still tired of them and wanted a break. Ashley seemed to have other ideas though. But then she wasn’t being forced to wear them…or use them. And while we’re talking about it, don’t get me started on how tired I was of keeping that damn pacifier in my mouth all the time as well. The damn diapers were horribly demeaning. I think the pacifier was just as bad if not worse! I got to my new little bedroom, and stopped in the doorway, staring at my bed, or rather, what was on my bed. Joanna and Ashley had already set out my clothes for the evening, and the one biggest thing they wanted me to wear, was something I had never seen before, and just looking at it caused the humiliation butterflies in my stomach to go crazy. Before I could get up the courage to go all the way into the room, Joanna was walking down the hallway, and I realized that Ashley was hobbling along after her. I took two steps into the room, then stopped and stared at it again. It was black but trimmed liberally with frilly white. The entire bust area was all white, there was white lace all around the bottom of the skirt, and the entire front between the white bust area and the skirt part had white ribbons to draw the middle of it in like a corset. And laid out on the bed right next to the dress was a white apron with ruffles and bows to match the rest of the dress. I took two more steps closer and realized the skirt on the thing looked very full, and that there was obviously something under it to puff it out since the front of it stuck up a little into the air. Two steps later, I realized that the skirt, despite looking so full, also looked very short. Would it hide my diapers at all? I wasn’t entirely sure. Get dressed? I was still trying to comprehend the dress just being there, let alone all the demented elements of it. How I would be doing? They had bought me a maid’s dress! 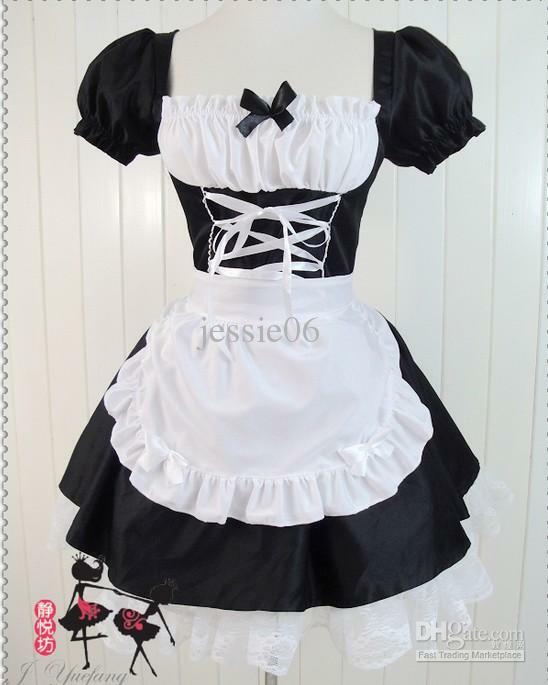 A frilly, silly French maid’s dress. Correction! They hadn’t bought it, Ashley had. Stockings. Look awesome on me? Interpret that to mean, stupid. Which is what I knew I was for signing that agreement, not to mention for being so stupid to want to do all the crazy things they made me do. A few minutes later, I was heavily wrapped up in another super thick diaper, the breast forms were held to my chest with a bra, and Ashley was holding the keys to my five inch t-strap heels that were once again locked to my feet so I couldn’t remove them. “Now get that dress on!” Ashley ordered impatiently. Yeah, get the dress on. But it was easier said than done, especially in the state I was currently in. I picked the thing up from the bed. Yes, there was a bunch of white netting under the skirt to keep it looking full and flared out. But was that stuff necessary since my diaper was so thick? Not that I’m sure Ashley cared. The back was already unzipped, so I stepped into it and started to pull it up my body. For a moment there, I didn’t think I’d get the thin waist of the thing past my bulky diaper. But with a little bit of tugging, it suddenly slipped past. I didn’t reply, I was too busy trying to figure out getting into the dress. I pulled my arms though each of the short sleeves and pulled the dress up over my shoulders. Now I just had to zip the thing up. I reached behind me, and after a moment of searching, finally located the zipper with my hand. I tugged it up…a little, and it stopped. Stuck. Not anything wrong with the zipper. The problem was me. My waist and chest were too big for the dress. To be honest, I wasn’t sure if I was disappointed or glad. “Here, let me help,” Joanna offered. I turned around and felt her grabbing the zipper. I felt her struggling with it and pulling it up just a little. The dress was suddenly compressing my upper waist. Loosen the laces? And here I thought they were going to have to send it back and I wouldn’t be stuck wearing it. I turned around and Joanna untied the ribbons on the front and loosened the laces, the dress immediately felt much looser. I turned around, and this time when she grabbed the zipper, she had to fight with it a bit, but it quickly went all the way up. “Ashley, do you have the lock?” Joanna asked. “Right here Mom,” Ashley replied. A moment later, I felt Joanna messing with the zipper at the top of the dress, and my ears picked up the sound of a lock clicking shut. “A lock?” I asked as I turned around to face them, not sure I believed it. “Mom suggested it,” Ashley replied. “I was going to get you a different dress, but Mom thought that since you liked those shoe locks so you couldn’t get your shoes off, then she figured you would appreciate a dress that locked as well. Now you can’t get your shoes off…or your dress.” She giggled, and so did Joanna. Joanna now grabbed the ribbons on the front of my dress and began pulling them tight…forcing the dress to hug my body like a glove. Then she tied the ribbons with a bow and stood back. She took the apron from the bed, wrapped it around me, and tied it in the back. Would I be able to untie the thing by myself? Not that it mattered, since the dress was locked, I couldn’t remove any of it without help. “Lovely,” Joanna declared as she stood back next to Ashley to look at me. Yeah sure. Lovely in this case actually had to mean – ridiculous! “We’re coming now Mom,” Ashley said, her voice still full of amusement. No question about what was causing her amusement. Me! I didn’t answer. I could only stare at her. I felt…shocked. I felt…amazed. I felt…way too turned on by the situation. I looked down at my skirt. I couldn’t see my shoes unless I bent over somewhat or pushed the full skirt out of the way. When I did, I realized that a little bit of the bottom of my diaper was still just visible below the skirt. Anyone looking at me would still be able to tell if my diaper was wet or not, because that’s the area where the designs seemed to disappear first. I had a feeling that this dress was now going to be my new uniform for whenever I was home. It was embarrassing. Demeaning. Humiliating. And I secretly loved every bit of it. But I’d never admit that to anyone! I’m sure that dinner was excellent, as it always was whenever Joanna cooked. I just didn’t taste much. I was still too wrapped up in the fact that I was now wearing a French maid’s dress – and it was locked onto me so I couldn’t remove it if I tried – just like my high heels. I stared at her for a moment, knowing full well that she had more mischief planned for me. Then I went back to cleaning up the kitchen. I was just finishing wiping the counters when Joanna came into the kitchen to find me. “Done yet?” she asked. I pulled the silly plug from my mouth. “Just now,” I said as I threw a paper towel into the trash. “Good,” she replied with a hint of an evil smile. I noticed that nervous feeling in my stomach again. Was she going to have me “fill” that cookie jar now? And if so, with what? “Let’s go out to your workshop,” she said. My workshop? That surprised me. I dutifully followed her out into the cold and all the way to my workshop. Every step I took in that crazy dress seemed to emphasize my new sissy state. I worried more than ever about my neighbors noticing me, and that’s despite the fact that they already knew about me. Neither of us had grabbed a jacket or anything and my bare legs were just as bare wearing that dress as they were without it. And because of that and no jacket, I was really feeling the temperature difference. That area inside of my diaper was so insulated I’d never have to worry about the cold there. In fact, I’d rather enjoy a bit less heat inside those diapers for a change. It was the rest of me that needed more…covering up. Inside the workshop, she started looking around. “What are you looking for?” I asked as I pulled that crazy pacifier out again. “I keep it mostly back here,” I told her as I led the way to the back corner of my workshop. Once again that nervous pit in my stomach was back. “Tonight?” I asked, now completely worried about having to go out in public again. And I was wearing a locked on maid’s dress now. She smiled. “Then there’s no reason why we can’t go tonight,” she proclaimed. “Uh…I don’t have to go like this, do I?” I asked, just for confirmation. She shook her head. “No Mike. We agreed on that. You can wear your regular clothes…and those shoes of course. I almost breathed a sigh of relief, until I thought about going out wearing the high heels again. But that was the main part of her punishment for me. From now on I would be wearing women’s shoes everywhere except to work. Still, it wasn’t something I wanted to do. I stared at her for a moment. I didn’t really care about buying myself another tool. I rather liked buying tools. It was more the fact that once again I was going to have to go out in public wearing something I shouldn’t. I nodded my confirmation to what she had said, but I couldn’t seem to make any other sound. “Do we have to?” I asked as we left my workshop. “Of course!” she replied as she turned to me. I noticed that particular gleam in her eye. I had long ago learned to fear that particular look in her eyes. I feared it, but I still hungered for it at the same time.